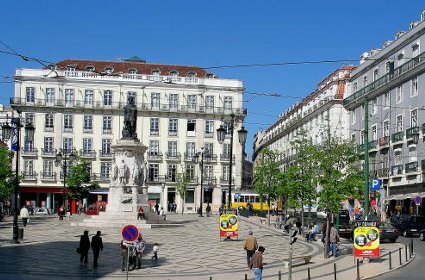 The cultural and shopping mecca of Lisbon is undisputedly the Chiado Lisbon district, whose elegant street ‘Rua Garrett’ has been placed along with other glamorous and fashionable streets around the world. 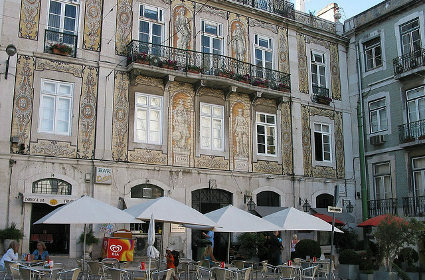 Playing neighbours to the various world renowned designer boutiques, are Lisbon’s very own cultural institutions and sights, including the famous “A Brasileira Cafe” or ‘Ourivesaria Alianca’, just to name a couple. 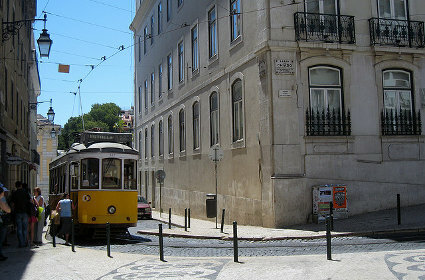 Stepping out of the Baixa-Chiado metro station, one is greeted by the row of antique shop fronts, ranging from the designer boutiques to the famous cafes and bookshops .To the west of the metro station is the open square ‘Praca Luis de Camoes’, connecting the bohemian “Bairro Alto” and the chic Chiado Lisbon district. 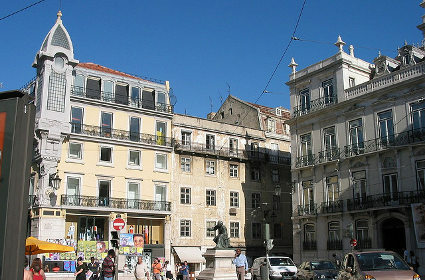 Walking down the street, “Rua do Alecrim”, away from the square, one comes in view of the statue erected by the writer, Teixeira Lopes. 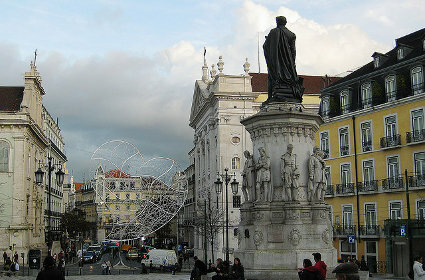 The Statue of “Eca de Queiros”, of the many sculptures dotting the streets of Lisbon. One street down south of “Rua Garrett”, a short walk diagonally from the metro, is the opera house of Lisbon, “Teatro Nacional de Sao Carlos”, along “Rua Serpa Pinto”. Rebuilt in neoclassical architecture in 18th century, after the original opera house fell victim to Portugal’s Great Earthquake of 1755, this building’s designs shows Italian influences. Outside the opera season, between September to June, other performing arts events are held here, while the premises are also available to host private events. The “Museu do Chiado” (Chiado Museum), also situated on “Rua Serpa Pinto”, a stone throw further south of Sao Carlos Theatre, is brain candy for art enthusiasts and a visual treat for all other visitors. The beautiful building, a former warehouse restored stylishly, offers as much to admire as the fascinating collection dwelling within its walls. The circular windows as one enters the museum and the doorway, are some of the pretty features, presented as appetizers before the main servings of the Portuguese painting and sculpture collection. The permanent collection is rotated regularly and the museum also displays temporary exhibitions. There is a lovely garden within the museum premises, which is a cool spot to enjoy light snacks and favourite drinks, prior or after viewing the art collection. Along this same street, a popular cafe serving Viennese delights, Koffehaus, has been winning the hearts of the locals. This airy cafe with minimalist décor, will certainly be a refreshing stop between the tours. The pinnace of highlights found in the Chiado Lisbon district could possibly be the stunning structure and designs of the Baroque churches – “Igreja de Sao Roque” and ‘Igreja do Carmo’. 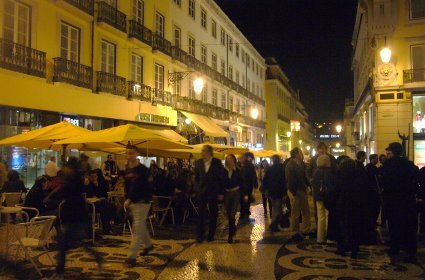 The ‘Sao Roque’ is located further north of Chiado Lisbon district, closer to the Bairro Alto and a street away from the ‘Elevador de Santa Justa’. The very modest exterior of this church hides the extraordinary beauty inside, decorated with precious embellishments and the traditional tiled decor. Adjoining this church you can find the Museum of Sacred Art, which is home to Portuguese paintings from the 16th century, among other impressive collections.